Halloween is just around the corner, and it’s that time of the year once again to start thinking about amazing pumpkin carving designs to decorate your home. So, whether you are a newbie or a pro in carving pumpkins, these tips and design ideas can come in handy this season. If you want to get that flawless and attractive design for your pumpkin, it’s best to start by examining closely the shape, texture and quality of the pumpkin you plan to use. Generally, size is not the most important feature, since what matters most is that the pumpkin is smooth and unbruised. Flat pumpkins are hardly any good, and they are quite difficult to work on. Healthy pumpkins usually have sturdy stems, so be sure to check this feature. However, never lift it by the stem to prevent damages such as cracks and dents. It is also important to inspect the bottom portion of the pumpkin just to make sure that the base is intact. 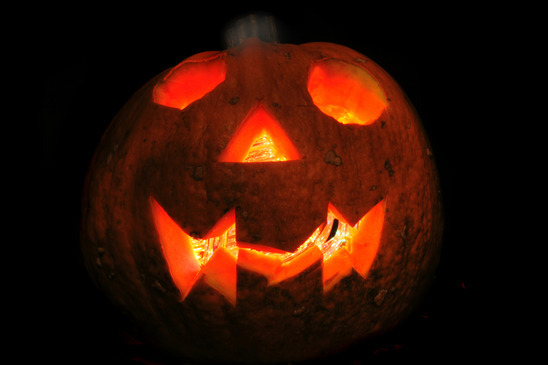 Pumpkins with a thin bottom can get easily punctured, and this makes them more prone to damages. In addition, avoid getting a pumpkin that has a sloshy and fairly heavy feel when you lift it. In most cases, this type of pumpkin may have rotten insides, along with some smelly and slimy goo that can destroy the overall quality of the design. No matter what design you prefer, be sure you use the right tools for carving. Basic tools include a pumpkin saw, scraper, pins, tape, knives, scrapers, drills and pokers. It is also best to prepare some saws with different lengths and spacing for the teeth. After all, you need a sharp device to use on tight areas, so it is better to be prepared with saws that are useful for the detailing process. Check the width of the drill, and it must be able to penetrate the pumpkin completely. The width of your drill has an impact on the hole size, which means you have to take this aspect into consideration when determining the right tools to use. A scraper is another important tool to prepare. This is an essential tool that can be used in giving the back wall of your pumpkin a smooth texture. After all, the back wall is where the reflected light comes from, so you have to make this area smooth and free from debris. Other tools to use include mini hand held saws, pokers and a wattermelon carving kit. While these may vary in terms of design, you are more likely to find varied patterns and scoops to meet your standards. Now that you have chosen your pumpkin, you can start by cutting the lid off and creating the right angle using the edge of your knife or saw. This way, you can create a cone-shaped wedge, since the last thing you want is to have the lid falling in. However, not all pumpkins are supposed to have lids. In case you want to put a candle inside, you should allow ample ventilation for your candle – and never put the lid on, or it will only get scorched. If you are looking to cast a projection, you may cut out the back or bottom and just preserve the top part. Once you have removed the strings and seeds of the pumpkin, start scraping the wall. Ideally, the wall of the pumpkin’s front part should not be over an inch thick since it will only make carving a nightmare. On the other hand, making the walls too thin will cause these areas wrinkle and dry out faster. As for the wall of the back portion of the pumpkin, you may only scrape it thinly when you are planning to cast a shadow. If this is the case, you may scrape it to about 1/2 inch thick. Patterns for the front tend to be about the same size as the pumpkin’s face. Keep in mind that you should never have any pieces floating, and this means everything needs to be connected to the walls of the pumpkin. If you are making a design for indoor display, you might want your pumpkin to project images at the back, as well as the flat surface. The pattern should also be the mirror image, so the image or text is projected correctly. Rear projection patterns are naturally smaller than regular patterns. These are also not any larger than about 4 inches square. Be sure that the pattern is towards the top part of the pumpkin’s back instead of being centered as the frontal pattern. As for the light source, it must be just under the cut pattern, since this can ensure the light to project well in an upward direction onto the wall. If you happen to find good patterns on the internet, you may have these scanned and enlarged. However, having your original pattern is an even better way to make your pumpkin stand out. You can also express your creativity by making your unique designs instead of making your pumpkin appear just like the others. Once you have chosen a pattern, be sure to tape this to your pumpkin. If you wish, you can put some tilts into your chosen pattern, as this can allow you to fold the paper around the pumpkin. Another option is to stick long pins into your pattern to keep it in place. As for the different carving design ideas, you may create varied images such as a Frankenstein image, 1974’s infamous Igor from the film Young Frankenstein, a classic Jack-O-lantern design, and a toothy grin with a wide smile and buck teeth. You can choose from a wide range of design ideas that will make your pumpkin look sensational and spooky at the same time. It is only a matter of selecting the right pumpkin, making the right preparations and ensuring the right fit of the pattern to your pumpkin. By applying this guide, you can make yourself a pro in pumpkin carving and have a great time this Halloween!